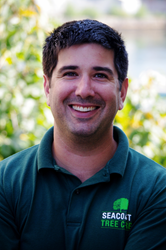 Daniel Mello of Seacoast Tree Care, the premier tree service company serving the Seacoast regions of New Hampshire, northern Massachusetts and southern Maine, recently earned the ISA Tree Risk Assessment Qualification. We feel it is important to continually educate ourselves in order to provide the highest level of service to our clients, and ultimately our community. Daniel Mello, certified arborist and owner of Seacoast Tree Care, recently earned the International Society of Arboriculture (ISA) Tree Risk Assessment Qualification credential by successfully completing the course and passing the exam administered by the ISA and the New England chapter of ISA. According to the ISA, the credentialing program is designed to increase the standard of practice and safety in the tree care industry and to promote the professional development of individual practicing arborists. Credentialing can also assist the public in identifying qualified tree care professionals. To maintain the qualification, individuals must take the course and pass the exam every five years.